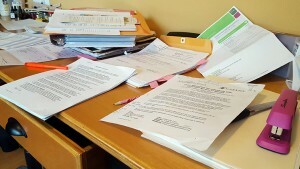 So, my recent reality has been a mountain load of paperwork. Being an adult, and having to tend to such responsibilities, can provoke a painful struggle with the carefree and child-like nature of my artist side. Today, I waded through junk mail, tax forms, notifications, bills, grant applications, etc. while feeling trapped and disappointed that another potential day in the studio had been eaten up by the locusts of adulthood. Just then, a creative idea hit like a flash. Though operating within a seemingly shallow level of surface duties, there was instant evidence of the engagement and reflection my mind was involved in on a deeper level. Surprised with new inspiration found in such an unexpected place, I paused for a moment to quickly scribble on a post-it note the new art ideas forming. I subsequently realized that had I not been immersed in the paperwork at that time, such an idea may not have been conceived. It had bubbled to the surface only in the midst of that moment when dealing with those specific papers. There was an appreciation, albeit brief, for the mundane and its unusual influence at times within the creative process. Now, I have extra motivation to tunnel through this white avalanche which buried me at one point and contributed to an epiphany the next.